2008 Chevy Silverado GMC Sierra 2500HD 3500HD (6.0 V8 Models) Volant Cold Air Intake System52008 Chevy Silverado 2500 HD DriverApril 3, 2010Noticed a small improvement in MPG. The bigger difference was in my mid range power. 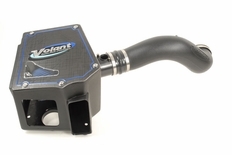 The part number for this Volant Intake is 15260 or 152606, depending on your filter choice, and it fits 2008 Chevy Silverado GMC Sierra 2500HD 3500HD 6.0 models.